What is this lovely image of sticks and moss and wildflowers, you might wonder? It might surprise you to be told that it is a casket. Ya, here I go again talking about how we shuffle off this mortal coil. But as someone who presided at 500 or more funerals and memorials through my years of ministry, I do have a fascination which I hope is not morbid but is definitely realistic about the inevitability of death. I've said before that I generally have respect for funeral directors. Most of those I worked with were professional, the majority compassionate, and some Christian. Still, this is a business, an industry which has become less personal and depends on burial methods that are costly and not that great for the environment. Body burial means putting lots of toxins into the earth and cremation requires a ton of energy. Why are these the principal options? This will be a different kind of cemetery: no rows of tombstones and monuments, and no plastic flowers. 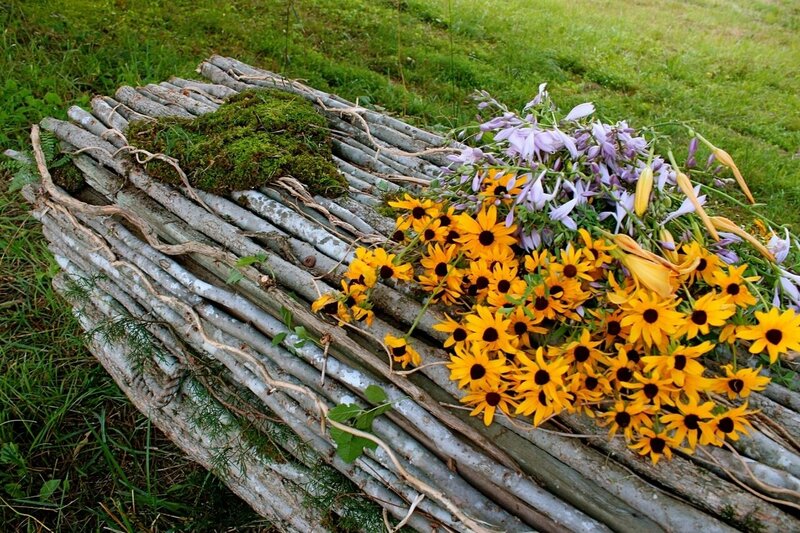 The nature preserve will be used for "natural burials" only. Caskets are optional, as are makeup and clothing on the body. Vaults around the caskets are prohibited. So are headstones, beyond a native stone from the property. No need for a hearse. Graves average 3.5 to 4 feet deep — or a bit deeper for biodegradable caskets — in the microbe-rich, living layer of soil. Ceremonies may involve clergy of any faith, or none at all. Walking through a meadow on the property, ... Phifer says, "People [who] choose to be buried in this area are the people who want wildflowers blooming on their grave and butterflies fluttering about." This sounds far more reasonable to me. Sure, you're still dead, but why leave a toxic slick on your way out? It is important for humans to depart this life with respectful ritual and burial. For many of us affirming our hope of eternal life in Christ matters as well. I do think we will make the shift to more responsible burial practices which in some respects will be a return to the ways of our forbearers. Does this appeal to you? Have you made plans for your, um, disposal?